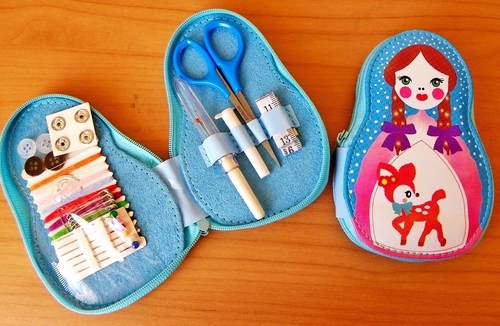 This 12pc Russian Doll sewing kit comes in a reusable zippered case. Includes hand needles, pearl head pins, seam ripper, needle threader, 3" scissors, hooks and eyes, snaps, safety pins, thread, measuring tape, and buttons. Kit is approx. 5" x 3 1/4" closed.